Maintaining dental health has two main components – at-home dental hygiene and professional cleanings and examinations. Simple maintenance of your dental health can prevent complications such as tooth loss, as well as the need for restorative or cosmetic dentistry in the future. Brush at least twice daily using a soft-bristle toothbrush and ADA-accepted fluoride toothpaste. This helps prevent tooth decay, gum disease, and the need for costly cosmetic or restorative dentistry in the future. Replace your brush every two to three months. A dental cleaning (prophylaxis): This includes scaling plaque, polishing teeth, flossing, assessing your mouth’s cleanliness, and providing oral hygiene instructions. If you wish to learn more about proper brushing and flossing techniques, ask us about it at this stage of the visit. Following the clinical dental exam, Dr. Colker will discuss a detailed treatment plan, with you, if necessary. Our staff will schedule a follow-up visit for you. Adults: As a New Patient - A full series of X-rays is indicated when there is evidence of dental disease or history of extensive decay. This will be repeated every 3-5 years. If you have Gum Disease (Periodontal disease) every three years is the recommended amount of time. Children: As a New Patient full month x-rays should be taken. This helps us see the development of the teeth and look out of decay. As a continuing patient with a high level of decay x-rays should be taken every 6 month until no decay is present. If the patient has low level of decay once every 12 months would be recommended. I want beautiful teeth. How can I get them? Removable partial denture (RPD): is for a partially edentulous (no teeth) dental patient who desires to have replacement teeth for functional or aesthetic reasons, and who cannot have a bridge (a fixed partial denture) Or implants for any number of reasons, such as a lack of required teeth to serve as support for a bridge (i.e. distal abutments) or due to financial limitations. Maryland Bridge: A resin retained bridge (Maryland Bridge) is a dental prosthesis replacing a missing tooth that relies for its retention on a composite resin cement. A Resin-bonded bridge consists of a cast metal framework that is cemented with resin composite to an abutment(s) which has preparation(s) confined either entirely or almost entirely to enamel. The resin retained bridge is a good treatment option for many missing teeth as it is relatively cheap when compared to alternatives such as dental implants, requires little or no damage to the surrounding teeth during preparation for placement, and it is well tolerated by patients. The resin retained bridge is increasingly being used in modern dentistry as an alternative to more destructive treatments. This has been driven by the advent of evidence based dentistry showing the benefits to patients of reduced tooth preparation and the importance of an intact enamel structure for the long-term health of the teeth. Dentures: Also known as false teeth, are prosthetic devices constructed to replace missing teeth; they are supported by the surrounding soft and hard tissues of the oral cavity. Conventional dentures are removable. However, there are many different denture designs, some which rely on bonding or clasping onto teeth or dental implants. There are two main categories of dentures, the distinction being whether they are used to replace missing teeth on the mandibular arch (lower arch) or on the maxillary arch (upper arch). If you have been told you have periodontal (gum) disease, you’re not alone. Many adults in the U.S. currently have some form of the disease. Periodontal diseases range from simple gum inflammation to serious diseases that result in major damage to the soft tissue and bone that support the teeth. In the worst cases, teeth are lost. Whether your gum disease is stopped, slowed, or gets worse depends a great deal on how well you care for your teeth and gums every day, from this point forward. Our mouths are full of bacteria. These bacteria, along with mucus and other particles, constantly form a sticky, colorless “plaque” on teeth. Brushing and flossing help get rid of plaque. 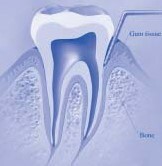 Plaque that is not removed can harden and form “tartar” that brushing doesn’t clean. Only a professional cleaning by a dentist or dental hygienist can remove tartar. This can cause gingivitis. Periodontal treatment methods depend upon the type and severity of the disease. We will evaluate your progression of periodontal disease and recommend the appropriate treatment. Periodontal disease progresses as the sulcus (pocket or space) between the tooth and gums gets filled with bacteria, plaque, and tartar causing irritation to the surrounding tissues. When these irritants remain in the pocket, they cause infection and damage to the gums and eventually, the bone that supports the teeth. If the disease is caught in the early stages (known as Gingivitis) and no damage has been done, one to two regular cleanings may be recommended. You will also be given instructions on improving your daily oral hygiene habits and having regular dental cleanings. However, if the disease has progressed to a more advanced stage, where the infection has caused bone loss and diseased pockets have formed, your treatment options may include scaling and root planning, bone surgery or gum therapy. You may not have considered orthodontics (orthodontia) for your child yet, and you may think that your child does not need dental braces until all of the baby teeth have fallen out. While this may be the case, the American Association of Orthodontists recommends that children see an orthodontist by age 7. This is because some orthodontic problems are easier corrected when the child is younger. Waiting to get braces or starting orthodontic treatment after all permanent teeth have erupted may lead to difficulty in correcting some types of orthodontic problems. By age 7, most children will have begun growing in some permanent molars (back teeth) and incisors (front teeth) so the orthodontist can evaluate if there is an existing problem. Fitting children with braces demands an office dedicated to providing specialized childcare. We will refer your family to an excellent Dentist to ensure the best care for your family. Should I remove my silver filling because of Mercury? Cavities are nothing to smile about but is there greater worry for the millions who have "amalgam" fillings — silver-colored fillings with mercury? Many health advocacy groups, such as Consumers for Dental Choice, claim the fillings are dangerous. The American Dental Association and the Food and Drug Administration say the mercury in the fillings is at safe levels. But that didn't stop the FDA from recently holding another investigative hearing looking into the safety associated with their use. A patient has had her silver fillings for three decades. She knows they contain mercury, a known neurotoxin, so when they started breaking apart, she took action because her teeth were breaking too. "You know, I've read about it and I'm concerned but not real concerned — not enough to have them all replaced without having a problem with them,". Dr. Colker stopped using silver fillings, known as amalgams, almost 15 years ago. Amalgams have been used for more than 100 years. Dr. Colker doesn't think they're a health danger to patients — as long as they're intact. "If people have silver fillings in their mouths that are functioning well and there's no break down, I really don't see a reason, at this point, to take them out," Dr. Colker says the bigger risk is when the silver starts to break down, bacteria can get into the gaps and cause more decay. "So many teeth and fillings have to be redone because teeth fracture and much of that is because so much of the tooth was cut away to get that silver filling to hold," he says. The new replacement, called composites, look more like a tooth, bond better and make the tooth stronger — but they're also more expensive. In the summer of 2009, the FDA concluded that despite the mercury content, levels in dental amalgam fillings are not high enough to cause harm in patients. However, they classified it as a class 2 device, meaning it has moderate risk. The FDA recommends that amalgam fillings not be used in patients with a mercury allergy and that dentists must have proper ventilation when handling it. The FDA has agreed to hold additional hearings regarding its use and safety but no changes have been made.